Looking for a Free Domain and inexpensive hosting for your web site? 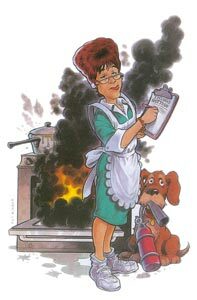 The Cafeteria Lady has been a popular feature of Brio Magazine since our very first issue. We thought it would be fun to give readers a little behind the scenes look this Grand Dame of Disasters--The Cafeteria Lady. Brio: Cafeteria Lady, when did you first decide that you wanted to be, well, a cafeteria lady? Caf Lady: In elementary school I was torn between wanting to grow up to be a chef and wanting to be a firefighter. So, in a sense, I’ve combined both. Brio: Yes, we’ve heard about your kitchen fires. Caf Lady: I prefer to refer to them as very large dinner candles. Brio: Didn’t you once have a turkey explode in your oven? Caf Lady: A minor explosion. There weren’t any injuries or anything like that. Except, of course, to the bird. I’m still waiting for one of the drumsticks to land. Brio: So would you say you’re a danger in the kitchen? Caf Lady: I do risk my life on occasion, but it’s a sacrifice I’m willing to make for my readers. Brio: But you wouldn’t recommend they follow your cooking style, say, in their home economics classes? Caf Lady: No. What I do should never be tried at home. Only by professionals. Brio: So you do consider yourself a professional chef? Brio: What kind of education do you have? Did you attend a professional chef’s school? Caf Lady: Yes. For about a week. The school’s insurance company said I had to quit. But I learned a lot in that week. Brio: But you didn’t attain a degree? Caf Lady: One of the firemen said my grilled cheese attained 800-degrees before going up in smoke. Is that what you mean? Brio: Not exactly. But we’ll move on. I believe our readers would like to know more about you personally. Are you married? Brio: Does your husband like your cooking? Caf Lady: I don’t know. He always disappears around dinner time. Brio: Do you have any hobbies? Brio: You know like collecting rocks. Caf Lady: Is that a crack about my biscuits? Brio: We’ll move on to another question. What’s it been like working with Susie Shellenberger and Marty McCormick over the years. Caf Lady: It’s been great. Susie’s a real kick. And she’s always been so appreciative of the gifts I’ve sent her at Christmastime. Brio: We heard she laid half her patio with your fruitcakes. Caf Lady: She did that for sentimental reasons, I’m sure. Marty’s been lots of fun, too. Brio: How long have you been writing for Brio? Caf Lady: Susie offered me this column when the magazine first started 14 years ago. Brio: That’s a long time. Brio: That’s a lot of stomachaches. Caf Lady: Yes, but they love it. There’s something about my cooking that people just can’t forget. Brio: Salmonella has a way of doing that. Caf Lady: You stick to your cooking secrets, I’ll stick to mine. Brio: Fair enough. 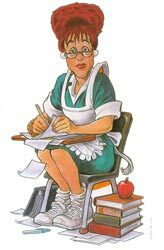 One project you have coming up is the Cafeteria Lady Best Cafeteria Food in America contest. Tell us about that. Caf Lady: I'm on a mission from Tums. Just kidding. Actually, I'm visiting one school per state to see which state, in my humble opinion, has the best cafeteria food. Pray for me. Brio: And you'll be starting that this year? Caf Lady: Yes, girls are already writing in and inviting me to their schools. One girl even wrote from Pakistan! I'd love to go, but as you know we're on a budget and that's a little far to swim. Brio: You'll be sure to give us regular updates and pictures, right? Caf Lady: Absolutely! I'll even send you samples of the food. Caf Lady: It's no problem. Brio: No, really. That's all right. Caf Lady: You've eaten my cooking. How bad could it be? Brio: We'll be praying for you. Caf Lady: Well, I know there's got to be some great cafeteria food out there, and I'm going to find it, even if it kills me. Wait a minute...bad choice of words. Brio: We appreciate you taking time out of your busy schedule to talk with us. Brio: Just one final questioon. Do you have any plans of retiring soon? Caf Lady: Are you kidding? The look I see on people’s faces when I cook for them is all I need to keep me going. Brio: A look of terror does that for you? Caf Lady: To the untrained eye it may look like terror. But I look beyond the wide eyes and greenish tint in their cheeks and see love and gratitude. And suddenly, it’s all worth it.